Five lads were exploring around Castleton in Derbyshire. We bumped into each other once or twice and formed a lasting friendship. We visited Peak Cavern, Winnets Pass, Giants Hole and Peveral Castle. There was Malcolm (Tiger) Culshaw from Southport, Pete Matley from Salford, Frank Shuttleworth (Bazz of Bolton) and Philip Wallace from Bolton and myself from Barrow. It was summer 1955. We decided to meet up again the following Easter at Ingleton. It was summer 1955. We decided to meet up again the following Easter at Ingleton. So in 1956, after exploring a few caves around Ingleton and Clapham, we decided to form ourselves into a proper group. It was August-September 1956 we held a meeting in the Wheatsheaf Hotel, Ingleton. Because it was known that several entrances, though unsafe and flood-liable, permitted access to the cavern of Mossdale Scar, the Club wanted to bury the remains of its friends who had perished there in 1967. The C.N.C.C. were therefore informed of the proposals and were asked to investigate the legal aspects surrounding the cave and its human remains. Was the cave now regarded as a tomb and, if so, must it remain inviolate? By whose authority had the entrance been sealed and were there any laws forbidding its reopening? News of the investigation leaked to the Press through the C.N.C.C. agenda and subsequent comment resulted in much distress to the parents of the six Mossdale victims. Since this had been the last thing club members had wished for, it was decided not to trouble the parents initially in case it was found that nothing could be done, thus letting them down after raising hopes. Enquiries at the Home Office and with the Coroner and the Police revealed that none had any jurisdiction in Mossdale matters. It transpired that the seal (which has no legal significance) had been put in after consultation with the C.R.O. and the U.W.F.R.A. during the rescue attempts. Both rescue organisations now agreed that, with respect to future explorations, the system was more dangerous with the seal than without it. However, the removal of the blockage would have to be negotiated with the "landowner". At this juncture, U.W.F.R.A. and U.L.S.A. cavers met the parents and explained their intention of burying the remains of the six cavers. Unanimously, the parents gave their consent and blessing to the scheme and asked that the landowner's permission be sought. With no danger to the burial party and with as little fuss as possible, the remains were to be buried in the Mud Caverns. 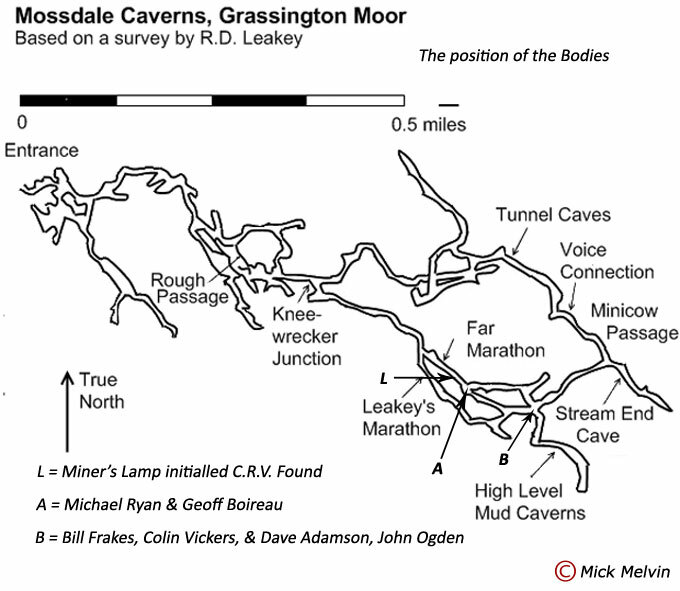 The entrance to Mossdale Cavern lies in the Common of Conistone Moor and hence no-one actually owns it. The farmers in the area are gate-holders and they possess the grazing rights. The shooting rights over the moor lie with Mr. Roberts. At a gate-holders’ meeting the majority were totally opposed to any further exploration of the Cavern because they were afraid that the 1967 incident might be repeated. However, they did agree to the burial proposals - provided that the entrance was resealed afterwards. With the red tape severed, the task itself was straight forward, although unenviable. It was carried out by nine Club members, eight underground and one on the surface, during a dry spell in February. There was no fear of prior (or even subsequent) publicity since only the individuals involved knew what was going on. The "sealed" New Entrance was not used. Now that the task is complete and all the remains have been buried it is hoped that the parents feel a little easier. All cavers will be relieved and our six friends would have been in agreement (and also horrified at the previous fuss). The present situation at Mossdale Scar has been unchanged for four years. The only safe entrance is blocked by boulders and could not be opened without the gateholders' permission. All other entrances are unstable and prone to flooding. It is only because of the flooding hazard that Mossdale Cavern is dangerous. The cave is the Everest of British caving -the ultimate challenge of future exploration - but there is no reason why it should become the Eiger as well. The final solution to the flooding hazard would be the construction, on the Conistone track, of a bridge and sluice which could be operated when a party was down the cave. Any unexpected cloudburst could then be diverted and a repetition of another tragedy prevented.